Mill-Max is pleased to introduce new .050” (1,27 mm) pitch spring-loaded right angle and horizontal SMT connectors to its standard product lineup. These new connectors offer space saving spring-loaded solutions for a variety of interconnect applications. Both connector series are ideal for mating boards in a perpendicular orientation or for parallel, daisy chaining applications. The centerline mating height is .0435” (1,1 mm) from the board surface with a total profile height of .087” (2,21 mm). The fine pitch and low profile are desirable for dense packaging requirements while maintaining the durability and reliability expected of quality interconnect components. The right angle, 854-22-0XX-20-001101, is a through-hole mount connector with .016” (0,41 mm) diameter solder tails suitable for board thickness up to .100” (2,54 mm). The 854-22-0XX-40-001101 is a horizontal surface mount (HSMT) with .016” (0,41 mm) diameter termination leads held to a .005” (0,13 mm) co-planarity. They each have a .0275” (0,7 mm) working travel (mid-stroke) and a maximum stroke capability of .055” +/-.005” (1,4 mm – 0,13 mm). Each series is single row and has standard availability of 1 to 20 positions (higher pin counts available upon request). These connector series are also available with mounting pegs on the insulator housing to provide additional strength and alignment. To specify connectors with mounting pegs, modify the part numbers as follows: right angle series, 854-22-0XX-20-601101; horizontal SMT series, 854-22-0XX-40-601101. (See the attached datasheets for pad and hole layouts, as well as part number information). These connectors, along with new right angle and HSMT target connectors, provide great versatility for diverse mating configurations. These two new series also maintain the quality and reliability of current Mill-Max spring pin connectors by utilizing the same precision-machined external components and internal spring technology. Gold-plated components and springs ensure the highest conductivity, corrosion resistance and durability. 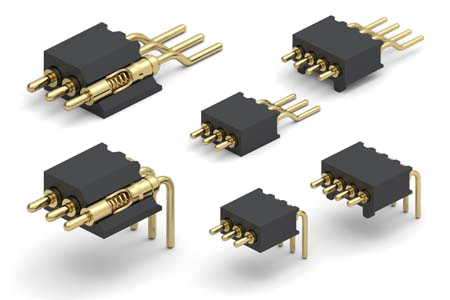 The spring-loaded pins used in these connectors have a current rating of 2 amps continuous use (3 amps maximum). The high temperature plastic housing is suitable for all soldering processes and the connectors are RoHS compliant.